Sony KD-65A1 review | What Hi-Fi? Sony once again shows the rest of the TV world how it’s done. 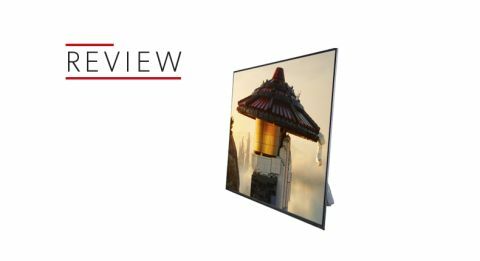 When LG took the decision to sell its OLED panels to its rivals, we wonder whether the company anticipated the possibility of one of those rivals producing a TV that trumped its own models? Maybe the company’s execs felt that its headstart and intimate knowledge of the hardware gave it a distinct advantage. But if so, that’s no longer the case. By combining LG’s hardware with some of its own superb software, Sony has already given its rivals a bloody nose with the 55in KD-55A1 - and it has returned to dish out the same punishment with the 65in version. You may be aware of the unusual design of the Sony A1, but it bears repeating. Essentially, this is a TV in two parts: a super-thin, super-flat slab of screen with practically no bezel and not even a Sony logo to distract the eye, with a chunkier, but narrower, back panel that folds away from the screen section like the legs of an easel. This back section is also where all of the TV’s connections, processing bits and pieces, and subwoofer are housed. The rest of the speaker system consists of four drivers pressed against the rear of the screen that vibrate the glass panel itself to create sound. This technology has been around a while now, but the A1 is the first TV to incorporate it. From a design point of view, it means the speaker system is essentially invisible, which is one reason the A1 is able to be almost entirely bezel-less. On an AV rack or TV unit it looks pretty spectacular, but make sure your furniture is wide enough that the panel doesn’t hang awkwardly over the edges. You also need to check it’s not too high either, as the way the screen leans back slightly will have you viewing at an odd angle. The A1 arguably looks even better when wall-mounted, which is made possible by standard VESA points. The back section is relatively thick and pushes the panel a few centimetres from the wall, but because it’s also a lot less wide, it has the effect of making the screen look as though it’s floating. In short, the A1 is a fabulous, unique piece of design that Sony should be immensely proud of. But that great first impression would count for nothing if picture performance turned out to be less than stellar. Happily, the A1 is even better than it looks. Head straight for a 4K HDR film such as Alien Covenant, and the Sony wastes no time in blowing your mind with its presentation. The pure, inky blacks that are OLED’s trademark are a genuine revelation, particularly if you’re upgrading from a backlit LCD set. But what makes the A1 special, and a step up on LG’s own OLEDs, is the brightness and punch it can also muster. We’re not talking the sort of brightness you’ll get from a good LCD TV, but it’s more than enough to produce rather appealing contrast when combined with those spectacularly deep blacks. Alien Covenant provides the perfect demonstration of this near its start, as the USCSS Covenant extends its solar sails, creating a glorious, bright, reflective golden surface against the infinite blackness of deep space. A standard backlit TV will inevitably sacrifice some black depth to get the sails shining as brightly as they should, while most OLEDs struggle a little for peak brightness. The Sony A1 delivers a masterclass, and an image that’s entirely believable and utterly stunning. Tempting though it is to pause the film and stare at the dazzling image a while, we continue our viewing. While the movie leaves a little to be desired, the visual experience via the A1 most certainly does not. There’s real depth and lusciousness to the colours - they work wonders to increase the (predictably false) utopian appearance of Planet 4. But the Sony never veers into unrealism, instead treading the thin line between vibrancy and naturalism with confidence. It’s a fabulously solid image, too, thanks to super-sharp edges and the three-dimensionality-enhancing black depth - the A1 digs up and displays every last drop of detail from the disc. While the likes of Samsung and LG force you to choose between a slight blurring (without motion processing on) and a soap opera-effect (with motion processing engaged), the A1 boosts Sony’s reputation as the company that gets motion right. Leave MotionFlow set at Standard and the TV keeps edges sharp and blur-free through challenging pans and fast-paced action - and without venturing into the uncanny valley. In short, there is really nothing to pick holes in when it comes to the Sony A1 displaying a 4K Blu-ray, and it’s a similar story with Full HD. Again, the picture simply looks ‘right’ – exactly as the director envisioned – with balanced colours, a flawless balance of deep blacks and pure whites, and an insatiable thirst for detail. There are Freeview and satellite tuners on board, and Full HD channels viewed via either are predictably crisp, colourful and all-round pleasant. Upscaling standard-def to 4K resolution is a big ask, particularly at 65in, but the A1 does an admirable job. It produces a clean and controlled image that’s certainly no insult to the eyes. Yet LG’s 2017 OLEDs are even more capable in this respect, should that be a serious consideration for you. Something that gamers consider is input lag, which dictates how quickly your gamepad button-presses are reflected on-screen. As with the 55in version, the KD-65A1’s Game Mode has a low input lag (of about 31ms when fed a 4K signal from a PS4 Pro or Xbox One S). However, if you have the standard 1080p version of either console you’ll be getting a higher lag of about 47ms. That might sound like a lot, but it’s something that only competitive gamers and those who are very sensitive to this type of lag should worry about. For the vast majority it’ll be completely unnoticeable, and games look splendid on the A1. It’s not hard to get the A1 performing at its best, either. Simply turning off the Light Sensor, taking a few points off the Colour setting and dropping Live Colour from Medium to Low produces a picture that we’re very happy with. You’ll need to make those same adjustments when you feed the TV an HDR signal for the first time, but it takes just a few moments - and once it's done you can pretty much leave the picture settings alone. Speaking of menus, the Sony has a rather odd approach. This is an Android TV, currently running 7.0 Nougat, but on occasion (such as when making picture adjustments) you’re presented with a completely different, Sony-developed, set of black and white menus. Meanwhile, Freeview is provided by YouView, which brings with it yet another aesthetically divergent UI. As you can imagine, that makes for a rather disjointed user experience that’s a far cry from the slickness offered by Samsung and LG in 2017. Even on its own, Android TV is rather ponderous - although it does deliver on the apps front (Now TV is the only major omission) and means the telly effectively has Chromecast built-in, allowing you to quickly and conveniently send content from your phone to the screen. That’s a particularly nice way to interact with the telly, when you consider how rudimentary the A1’s bundled zapper is. There are shortcut buttons for Netflix and Google Play, but the remote is otherwise cluttered and really rather dull. One limitation worth bearing in mind is only two of the four HDMI inputs (2 and 3) support 4K HDR signals. Most people won’t have more than a couple of such sources at this point, though, and if you already do (or will get to that level shortly) you’ll probably also have an AV amplifier or other sound solution sitting between your sources and screen. Still, it’s an odd decision, and one that Sony’s essentially alone in making this year. Ultimately it’s wouldn't put us off buying this TV. Unlike most TVs, which cram tiny speakers wherever they fit – even if that means firing at odd directions – the Sony’s entire screen fires sound straight at you, resulting in a direct delivery that’s more engaging as a result. The rear-facing subwoofer adds the sort of weight and depth to proceedings most rivals would need a separate bass-box to muster. In short, it’s a weightier, more full-bodied and all-round better sonic performance than is available from practically any other TV right now. But that isn’t to say it’s perfect. This is good sound by flatscreen standards, but it’s still quite easily trumped by a capable soundbar. If you’re spending £4500 on a new television, you probably owe it to yourself to partner it with a soundbar at the very least. Ideally you'll deploy a full surround system. We loved the Sony A1 in its 55in guise, and the 65in version is more of the same. This is precisely the kind of picture that’s only enhanced as it gets bigger. Of course, the price increases with the screen size - £4500 is a huge amount to spend on a telly, OLED or otherwise. But if you’re even contemplating it, we’d recommend taking the plunge. This is probably the finest TV money can currently buy, and it’s not a purchase we can imagine anyone regretting.